Expression of correct neurotransmitters is crucial for normal nervous system function. How neurotransmitter expression is regulated is not well-understood; however, previous studies provide evidence that both environmental signals and intrinsic differentiation programs are involved. One environmental signal known to regulate neurotransmitter expression in vertebrate motoneurons is Hepatocyte growth factor, which acts through the Met receptor tyrosine kinase and also affects other aspects of motoneuron differentiation, including axonal extension. Here we test the role of Met in development of motoneurons in embryonic zebrafish. We found that met is expressed in all early developing, individually identified primary motoneurons and in at least some later developing secondary motoneurons. We used morpholino antisense oligonucleotides to knock down Met function and found that Met has distinct roles in primary and secondary motoneurons. Most secondary motoneurons were absent from met morpholino-injected embryos, suggesting that Met is required for their formation. We used chemical inhibitors to test several downstream pathways activated by Met and found that secondary motoneuron development may depend on the p38 and/or Akt pathways. In contrast, primary motoneurons were present in met morpholino-injected embryos. However, a significant fraction of them had truncated axons. Surprisingly, some CaPs in met morpholino antisense oligonucleotide (MO)-injected embryos developed a hybrid morphology in which they had both a peripheral axon innervating muscle and an interneuron-like axon within the spinal cord. In addition, in met MO-injected embryos primary motoneurons co-expressed mRNA encoding Choline acetyltransferase, the synthetic enzyme for their normal neurotransmitter, acetylcholine, and mRNA encoding Glutamate decarboxylase 1, the synthetic enzyme for GABA, a neurotransmitter never normally found in these motoneurons, but found in several types of interneurons. Our inhibitor studies suggest that Met function in primary motoneurons may be mediated through the MEK1/2 pathway. We provide evidence that Met is necessary for normal development of zebrafish primary and secondary motoneurons. Despite their many similarities, our results show that these two motoneuron subtypes have different requirements for Met function during development, and raise the possibility that Met may act through different intracellular signaling cascades in primary and secondary motoneurons. Surprisingly, although met is not expressed in primary motoneurons until many hours after they have extended axons to and innervated their muscle targets, Met knockdown causes some of these cells to develop a hybrid phenotype in which they co-expressed motoneuron and interneuron neurotransmitters and have both peripheral and central axons. Although different subtypes of motoneurons of invertebrate species use different neurotransmitters to activate muscle [1, 2], all vertebrate motoneurons activate muscle via release of acetylcholine (ACh) . Historically vertebrate motoneurons have been considered exclusively cholinergic. However, several recent studies provide evidence that mammalian spinal motoneurons release both ACh and glutamate from collaterals within the spinal cord that synapse with inhibitory interneurons known as Renshaw cells, although ACh is still thought to be the only neurotransmitter that mediates motoneuron activation of skeletal muscle [4–6]. It is unknown how two distinct neurotransmitters are differentially regulated within these motoneurons. But the importance of appropriate regulation is underscored by a recent study showing that forced expression of neurotransmitters other than ACh in frog motoneurons causes inappropriate expression of non-cholinergic receptors at the neuromuscular junction . Expression of the correct neurotransmitter is crucial for normal nervous system function, although the mechanisms that establish appropriate neurotransmitter expression are not well understood. Interneurons in the chick spinal cord can be induced to express ACh inappropriately by forced expression of MNR2, Lhx3, or Islet1 transcription factors [8, 9]. However, forced expression of these transcription factors causes the interneurons to initiate a program of motoneuron differentiation [8, 9] for which ACh is the appropriate neurotransmitter, suggesting that neurotransmitter expression is established by programs that specify cell fate. On the other hand, it is well-known that at least some neural crest-derived neurons of the peripheral nervous system normally change their neurotransmitter phenotypes during development, and that this is regulated by environmental signals [10, 11]. These studies show that under some conditions, neurotransmitter expression is altered in response to the environment after cell fate is specified. Consistent with this idea, changing calcium-mediated neural activity can regulate neurotransmitter expression in neurons in culture  and in vivo  without affecting expression of markers of cell fate specification . Together these studies suggest that regulation of neurotransmitter phenotype is complex and involves both intrinsic factors that regulate differentiation programs as well as responses to environmental signals. One environmental signal known to affect neurotransmitter phenotype in motoneurons is Hepatocyte growth factor (HGF; also known as Scatter factor). Axotomy of adult hypoglossal motoneurons leads to a dramatic loss of mRNA and protein of the ACh synthetic enzyme, choline acetyltransferase (ChAT); this loss can be prevented by administration of HGF . HGF has also been shown to stimulate choline acetyltransferase activity in motoneurons in vitro . HGF acts through the Met receptor tyrosine kinase , which is expressed in motoneurons and has been shown to be important for their development. For example, HGF acts through Met as an axonal attractant and survival factor for some populations of mammalian and avian motoneurons [14, 16–22] and has also been shown to be required to recruit a subpopulation of motoneurons to a specific motor pool . Experiments carried out using a variety of cell types have shown that activation of Met can initiate intracellular signaling through several different downstream cascades, including mitogen activated protein kinase (MAPK), phosphatidylinositol 3-kinase (PI3K) and p38 and Akt pathways [24, 25]. These cascades can act independently or can be stimulated simultaneously, and there can be crosstalk among them [26–28]. In addition to activation via Met, these intracellular signaling pathways can also be activated by other receptors [29–33]. To elucidate the roles of these pathways in cellular events, a number of specific pathway inhibitory reagents have been developed, including LY294002, which inhibits the PI3K pathway , U0126, which inhibits the MAPK pathway by inhibiting MEK1/2 , and SB203580, which inhibits Akt  and p38 MAP kinase  (Figure 1). It is currently unknown which of these signaling cascades is activated by HGF-mediated Met signaling in motoneurons, and whether different cascades affect different aspects of HGF-mediated Met function in these cells. Blocking Met function. (a) RT-PCR showing that the E6I6 MO blocks met mRNA splicing. (b) Activation of Met can initiate intracellular signaling through several different downstream cascades, including MEK1/2 and PI3K [24, 25]. This diagram shows the cascade and where specific inhibitors act. See text for details. In the present study, we have taken advantage of the experimental tractability of embryonic zebrafish to investigate the role of Met in motoneuron differentiation. Development of zebrafish spinal motoneurons has been well-characterized . 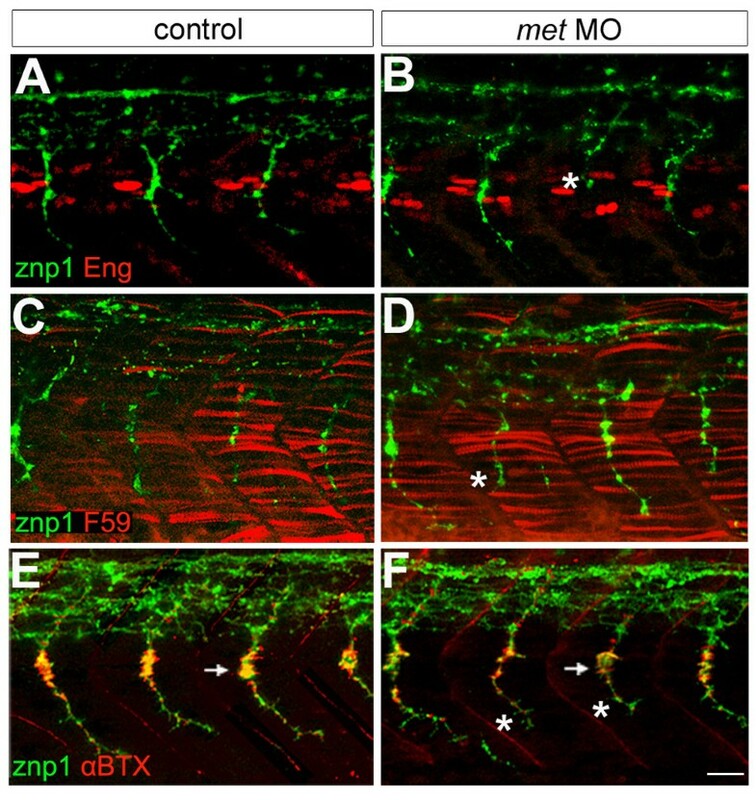 Zebrafish have two waves of motoneuron differentiation: primary and secondary motoneurons. Primary motoneurons (PMNs) constitute a small set of segmentally reiterated cells generated during gastrulation [38, 39]. Each PMN is individually identified based on its morphology and gene expression pattern. Within each spinal hemisegment, CaP has the most caudally located cell body, RoP has the most rostrally located cell body, and MiP has a cell body located between CaP and RoP. Some spinal hemisegments have an additional PMN, called VaP, which is essentially a duplicated CaP that typically dies . PMN axons pioneer nerve pathways followed later by axons of secondary motoneurons (SMNs) [41, 42]. SMNs are born later than PMNs and are more numerous . SMNs are born  and extend axons  over a protracted period of development; several studies suggest that there are distinct subsets of SMNs [44–47], although this has not yet been studied in detail. 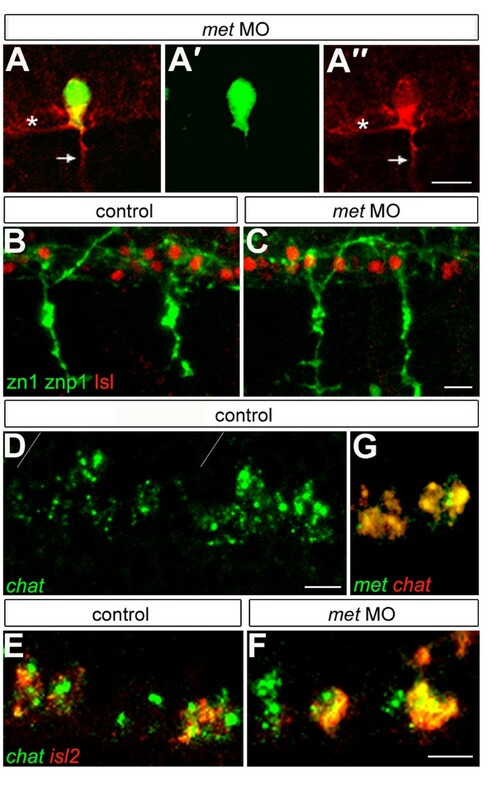 In addition to extensive characterization of their development, many recent studies have characterized the physiological properties of zebrafish motoneurons and how motoneurons are driven by interneurons to activate various types of behavior (see ). The neurotransmitters of zebrafish spinal interneurons have been extensively characterized. Specific subsets of interneurons have been shown to be glycinergic or glutamatergic [48, 49]. In addition, several types of interneurons have been shown to express the neurotransmitter gamma-amino butyric acid (GABA) [48–50]. A previous study showed that zebrafish met is a specific marker of CaP and VaP . We report here that a few hours later, met is also expressed in MiP and RoP, and that even later in development met is expressed in at least some, perhaps all, SMNs. We used morpholino antisense oligonucleotides (MOs) to knock down Met function and found that this had distinct effects on SMNs and PMNs. Many SMNs required Met for their differentiation and the SMN population was significantly reduced in met MO-injected embryos. In contrast, PMN differentiation appeared normal in met MO-injected embryos. However, some PMNs had truncated peripheral axons or developed interneuron-like processes within the spinal cord. In addition, in the absence of Met many PMNs inappropriately expressed GABA. Whether vertebrate motoneurons ever normally express GABA is controversial, and we return to this point in the discussion. To learn whether distinct Met-activated signaling cascades are responsible for the different phenotypes we observed following Met knock down, we used inhibitors that affect different pathways downstream of Met activation. Our results suggest that the p38 and/or Akt cascade may be required for SMN differentiation, whereas the MEK1/2 cascade may be required for appropriate neurotransmitter expression and to prevent formation of interneuron-like axons in PMNs. Together our results suggest that Met acts through different pathways to affect different aspects of motoneuron development. Zebrafish embryos were obtained from natural spawning of AB or AB/TU wild-type or mn2Et (also referred to as parg mn2Et ) , Tg(gata2:GFP)  and Tg(pax2a:GFP)  transgenic lines. Fish were staged by hours post-fertilization at 28.5°C (hpf) . In some experiments we co-injected mouse Met mRNA (mMet in pSP64; generous gift of G. Vande Woude, Van Andel Research Institute, Grand Rapids, MI, USA)  together with the MOs. As a further control to test whether RNA diluted the MO to a non-effective concentration, we performed a set of control experiments in which we injected a similar amount of lacZ mRNA, mMet RNA, together with the MOs. Injection of lacZ mRNA alone did not affect neuronal development. In contrast, injection of lacZ mRNA plus MOs resulted in a phenotype similar to injection of MOs alone, showing that any effects of mMet RNA plus MO injections were specific to the mMet mRNA. Met activates a number of different signaling pathways [15, 57, 58] and inhibitors that block these pathways have been previously used to test Met function (see Figure 1b) . We used the following inhibitors to test Met function in zebrafish: U0126 (InvivoGen; San Diego, CA, USA), which blocks MEK1 and MEK2 , LY294002 (InvivoGen), which blocks PI3K , and SB203580 (InvivoGen) which blocks p38 and Akt [36, 37]. Because LY294002 had severe effects on overall development, we did not pursue its effects on motoneuron differentiation. For the inhibitor studies, embryos were dechorionated and incubated in embryo medium. Cell permeable inhibitor was added at 16 hpf; embryos remained in the inhibitor solution until further processed at either 26 hpf or 48 hpf. We performed dose-response experiments to determine the optimal inhibitor concentrations to use for experiments. We tested concentrations between 10 and 120 μM. In both cases we found that concentrations below 50 μM had no effect and concentrations above 80 μM were deleterious to embryonic development. Therefore, we used both U0126 and SB203580 at 60 μM. RNA in situ hybridization and immunohistochemistry were carried out according to standard protocols . The following antisense RNA probes were used: islet2 (isl2) , glutamate decarboxylase 1 (gad1, also known as gad67 ), met (1.1 kb fragment spanning 1–1,165 bp of NCBI sequence AY687384; Entrez GeneID: 492292) and chat (900 bp fragment spanning 1,099–1,967 of NCBI sequence XM682602; Entrez GeneID: 559274). The following primary antibodies were used: JL-8 mouse anti-GFP (Chemicon; Temecula, CA, USA) was used at 1:200; zn1 (University of Oregon) was used at 1:150; znp1 (University of Oregon) was used at 1:750; rabbit anti-GABA (Sigma; St. Louis, MO, USA) was used at 1:1,000; anti-Alcam (Alcam was previously known as DM-GRASP, Neurolin, zn5 antigen, and zn8 antigen; University of Oregon) was used at 1:4,000; F59  was used at 1:10; 4D9  was used at 1:50. Primary antibodies were revealed using secondary antibodies coupled to Alexa Fluor568 (goat anti-rabbit 1:1,000; Invitrogen-Molecular Probes; Eugene, OR, USA); Alexa Fluor488 (goat anti-mouse 1:1,000; Invitrogen-Molecular Probes); Alexa Fluor546 (goat anti-mouse IgG1, 1:1,000; Invitrogen-Molecular Probes); Alexa Fluor488 (goat anti-mouse IgG2a, 1:1,000; Invitrogen-Molecular Probes); Alexa Fluor546 (goat anti-mouse IgG2b, 1:1,000; Invitrogen-Molecular Probes). To reveal ACh receptor (AChR) clusters, embryos were fixed at 4°C for 4 h, rinsed in phosphate-buffered saline, incubated in 5 μg/ml α-bungarotoxin (αBTX-546; Invitrogen-Molecular Probes) in incubation buffer [phosphate buffered saline plus 0.1% Tween/20 (PBT) + 1% dimethyl sulfoxide (DMSO) + 5% normal goat serum (NGS)] for 30 minutes at room temperature, rinsed in PBT, and then followed by a regular immunohistochemistry protocol (adapted from  with minor modification). Embryos were scored and photographed with a Zeiss Axioplan microscope and photographed using a Nikon Coolpix 995 digital camera or imaged using a Zeiss LSM5 confocal microscope. For characterization of cell death, embryos were stained according to Williams and Holder , with minor modifications. Briefly, embryos were incubated for 20 minutes in 5 mg/ml Acridine Orange (Sigma) in embryo medium, washed three times for 5 minutes in embryo medium and observed under fluorescence microscopy with an fluoro-iso-thio-cyanate (FITC) filter. We used high-speed imaging to monitor trunk movements evoked by touch . In our experiment, the head of the embryo was embedded in agarose in such a way that the trunk was not restricted in its movements. The embryo was stimulated with an insect pin mounted on a micromanipulator (Narishige; East Meadow, NY, USA). The stimulus was repeated 5 times at 1 s intervals and recorded using a high-speed digital video camera (Pixelink; Ottawa, ON, Canada) at 100 frames per second. Movies were analyzed using Quicktime (Apple) and individual frames were assembled for presentation in Adobe Photoshop. met expression began in 1–2 cells in the ventral region of each spinal hemisegment at 22 hpf (Figure 2a), but within a few hours it was expressed in many more cells (Figure 2c). To learn which cells were met-positive, we first asked whether met is co-expressed with islet2, a specific marker of CaP and VaP at 22 hpf . We found, as previously reported  that at this stage met was specifically expressed in CaP and VaP (Figure 2b), but not in other PMNs. However, by 26 hpf, met was expressed in all PMNs (Figure 2c). Later, by 48 hpf, met was detectable in clusters of four to eight cells in the ventral region of each spinal hemisegment (Figure 2d). To determine whether these met-positive cells were SMNs, we used transgenic embryos that express green fluorescent protein (GFP) under the control of the gata2 promoter [Tg(gata2:GFP)], which has been shown to be expressed in ventrally-projecting SMNs  (Figure 2e) and in some interneurons , and is routinely used to study SMN development [65, 47, 66, 46, 67, 68]. We also used embryos of the mn2Et line that express GFP under the control of the parg promoter  (Figure 2f). GFP has been previously reported to be expressed specifically in CaP in the mn2Et line . However, we find that, in this line, GFP is expressed in all zebrafish PMNs (Figure 2g–j), and in at least some zebrafish SMNs (Figure 2j). At 48 hpf, in mn2Et embryos all met-positive cells co-expressed GFP, but not all GFP-positive cells expressed met (Figure 2f) suggesting that met is expressed in at least some SMNs. We also found that many, but not all, met-positive cells co-expressed gata2:GFP (Figure 2e); cells expressing met mRNA but not GFP in Tg(gata2:GFP) embryos are probably PMNs and dorsally projecting SMNs that are gata2:GFP-negative. Together these results provide evidence that met is initially expressed only in CaPs and VaPs, but soon after it is expressed in other PMNs and later it is expressed in SMNs. These results do not allow us to conclude whether or not met is ever expressed by dorsally-projecting SMNs. In addition, because SMNs are born over a protracted period of development , we also cannot conclusively determine whether met is expressed by all ventrally-projecting SMNs or only by a subset of these cells. Zebrafish met is expressed in developing spinal motoneurons. All photographs are dorsal to the top and anterior to the left; this is also the case for subsequent figures except where noted. (a) A 22 hpf embryo showing met RNA expression in one cell of a spinal hemisegment (asterisk). (b) A 22 hpf embryo showing co-expression of met (green) and islet2 (red) in CaP and VaP. (c) A 26 hpf embryo showing met expression in all four PMNs in this spinal hemisegment. (d) A 48 hpf embryo showing met expression in eight cells (asterisks) in this hemisegment. (e) A 48 hpf gata2:GFP transgenic embryo showing GFP expression in ventrally projecting SMNs (green) and met expression (red) in a subset of these cells. The axon of the SMN labeled with an asterisk is shown as it projects out of the spinal cord toward its ventral muscle target. The inset to the left shows the same SMN, also marked with an asterisk, in only the red channel, clearly revealing that the SMN expresses met RNA. (f) A 48 hpf mn2Et transgenic embryo showing GFP expression (green) in PMNs and SMNs; met (red) is expressed in a subset of these cells. (g-j) mn2Et transgenic embryos at 24 hpf showing GFP expression in motoneurons: posterior segment showing GFP expression in CaP (g); posterior segment showing GFP expression in CaP and VaP (h); a more anterior segment showing GFP expression in CaP and MiP (i); an even more anterior segment showing GFP expression in CaP, VaP, MiP, RoP and several SMNs (j). Note that even as late as 5 days post-fertilization, in mn2Et embryos GFP-positive cells in the spinal cord all appear to have peripheral axons and no interneuron-like cells express GFP, suggesting that in the mn2Et line GFP is expressed exclusively in motoneurons. Scale bars, 10 μm. Expression of met in PMNs and at least some SMNs prompted us to ask whether Met function is necessary for proper regulation of motoneuron-mediated behaviors. Zebrafish embryos begin to exhibit spontaneous muscle contractions that result in coiling movements shortly after PMN axons first extend out of the spinal cord [69–71]; spontaneous coiling requires functional PMNs . met MO-injected embryos had normal spontaneous coiling, suggesting that some PMNs were present and functional. At later stages of development, embryos stop coiling spontaneously and instead respond to touch on the head or tail . Therefore, we compared motility of control and met MO-injected embryos at 28–30 hpf, a stage at which control embryos are touch-responsive but no longer coil spontaneously. Control embryos responded to tail touch with a stereotyped bend of the trunk (see ); the average time for completing the stereotyped movement was about 50 ms (Figure 3a,b). met MO-injected embryos had impaired tail touch-evoked motility (Figure 3a,b). They moved slower, with an average time for completing the movement of 190 ms, and often had spasmodic movements instead of the smooth bending seen in controls. The time-course of the touch-evoked behavioral response was significantly different between met MO-injected and control embryos, but was not significantly different between met mismatch MO-injected and control embryos (Figure 3d), showing that normal Met function is required for proper tail touch-evoked movements. Normal touch-evoked movements require Met function. Embryos are oriented anterior to the top and viewed from dorsal. (a) Control embryo (top panel), head embedded in agarose, responded to touch by bending away from the probe (asterisk); times indicated are milliseconds. A met MO-injected embryo (bottom panel) responded to touch significantly more slowly than the control. Data from the control and met MO-injected embryo are shown on the same time scale. (b) The same embryos as in (a), but for each embryo the entire time-course of the movement is shown. The entire touch response took about 50 ms in the control embryo, but took about 190 ms in the MO-injected embryo, which remained in the coiled position for about 60 ms. Red box indicates maximal bending. (c) Black arrows display the time span of one touch response, as shown in (b), for control and met MO-injected embryos; the red section indicates the time the embryo stayed in a coiled position. (d) Time frame in which control and injected embryos stayed in the coiled position [red in (b,c)]. The differences between control and control MO-injected embryos were not significantly different, but they were both significantly different from met MO-injected embryos (p < 2.6 × 10-13, n = 46 touch-evoked responses of 8 control embryos and 32 touch-evoked responses of 8 met MO-injected embryos; p < 1.07 × 10-7, n = 22 touch-evoked responses of 4 control MO-injected embryos and 32 touch-evoked responses of 8 met MO-injected embryos. Even though met MO-injected embryos responded significantly slower to tail touches than did control embryos, their ability to move suggested that muscle function was normal and that neuromuscular junctions were present. 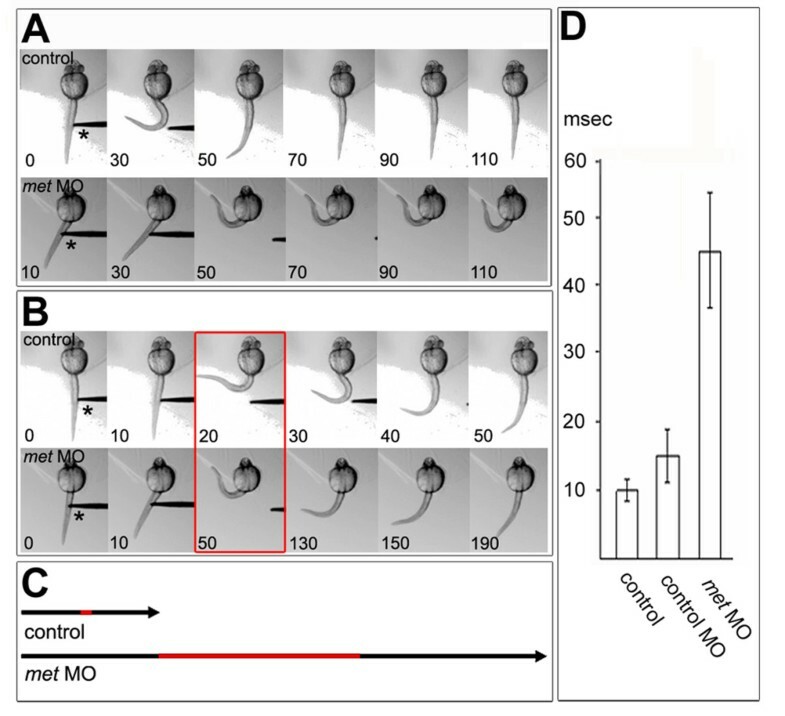 We verified this by labeling 26 hpf control and met MO-injected embryos with zn1 or znp1 antibodies that recognize zebrafish PMNs [69, 72] and antibodies that recognize specific muscle cell types, including anti-Engrailed that recognizes a specific subset of slow muscle fibers [62, 73] (Figure 4a,b), and F59, that recognizes fast muscle fibers (Figure 4c,d) . PMNs were present in met MO-injected embryos, although in some cases CaP axons were truncated (see below). Engrailed and F59 labeling were both present in met MO-injected embryos and appeared similar to controls. We also examined the localization of AChR clusters using αBTX . AChR clusters were present in met MO-injected embryos and had a similar distribution as in controls (Figure 4e,f). Together these observations raise the possibility that Met function is not required for formation of muscles or neuromuscular junctions and that the impaired tail touch-evoked motility of met MO-injected embryos resulted from a requirement for Met for normal differentiation of PMNs, SMNs or both. Met appears unnecessary for muscle and neuromuscular junction formation. (a,b) Engrailed antibody (Eng, red) labeling showing muscle pioneer cells and znp1 antibody labeling showing motor axons (green). In met MO-injected embryos, some CaP axons are truncated (asterisk). (c,d) F59 antibody (red) labeling showing fast muscle fibers and znp1 antibody staining showing motor axons (green). F59 labeling appears the same in control (c) and met MO-injected (d) embryos, which have some truncated CaPs (asterisk). (e-f) αBTX (red) labeling showing AChRs and znp1 antibody labeling showing motor axons (green). The distribution of AChRs appears the same in control (e) and met MO-injected embryos (f) that have some truncated CaP axons (asterisks); however, it appears that the number of AChRs may be decreased at the myoseptal varicosity (arrows) by MO injection. For each experiment, 8 spinal hemisegments plus somites were examined in each of 21–33 met MO-injected embryos and 8 spinal hemisegments plus somites in each of 15 controls. Scale bar, 20 μm. To learn whether Met is required for normal differentiation of PMNs and/or SMNs, we labeled 26 hpf and 48 hpf embryos with the znp1 antibody, which reveals primary and secondary motor axons . By 26 hpf, PMN axons had extended both ventrally and dorsally in control embryos (Figure 5a,a'). In met MO-injected embryos, dorsally projecting MiP axons appeared normal, but some ventrally extending CaP axons were truncated (Figure 5b,b'). However, only about 25% of CaP axons were affected by Met knock down (Figure 5e). Met is required for normal CaP axons. (a-b') Embryos at 26 hpf showing PMN axons labeled with znp1 antibody. met MO-injected embryos have normal MiP axons [arrow in (b')] compared to controls [arrow in (a')]. However, some CaP axons are truncated in met MO-injected embryos [asterisk in (b)] compared to controls (a). (c-d') Embryos at 48 hpf showing PMN and SMN axons labeled with znp1 antibody. As at 26 hpf, dorsally projecting axons in met MO-injected embryos appear normal [arrow in (d')] compared to controls [arrow in (c')]. However, some ventrally projecting axons are truncated in met MO-injected embryos [asterisk in (d)], compared to controls (c). (e) Average percentage of truncated axons in control and met MO-injected embryos at 26, 36 and 48 hpf. n (26 hpf) = 8 somites in each of 12 embryos; n (36 hpf) = 8 somites in each of 10 embryos; n (48 hpf) = 8 somites in each of 11 embryos. Scale bar, 20 μm. By 48 hpf, SMNs had formed both dorsal and ventral motor nerves (Figure 5c–d'). In met MO-injected embryos the ventral nerves appeared thinner than in control embryos (Figure 5c,d). Because znp1 labels both PMNs and SMNs, and in 75% of hemisegments CaP axons had extended normally, this result suggests that at least some SMN ventral axons were truncated or failed to extend when Met was knocked down. In addition, there were some truncated ventral nerves. Previous studies showed that CaP is unnecessary for extension of SMN ventral axons . Thus, the truncated ventral nerves could represent truncated CaP axons in segments in which SMN axons failed to extend. Alternatively, they could represent a combination of truncated CaP and truncated SMN axons. Together these observations suggest that Met is important for normal ventral axon extension by both PMNs and SMNs. We provide further tests of this hypothesis below. To learn whether Met was required for normal SMN development, we examined SMNs in met MO-injected Tg(gata2:GFP) embryos at 48 hpf. We also labeled these embryos with an antibody to Alcam, a cell surface protein expressed on floor plate and transiently on the somata and fasciculated segments of SMN axons . In 48 hpf Tg(gata2:GFP) embryos, most of the GFP-positive SMN somata were also Alcam-positive (Figure 6a,a'). However, there were many more Alcam-positive somata than GFP-expressing somata, consistent with the observation that gata2-driven GFP is expressed in ventrally projecting SMNs but not in dorsally-projecting SMNs [53, 66, 67]. In addition, Tg(gata2:GFP) embryos had some dorsally-located, GFP-expressing somata that were Alcam-negative (Figure 6a,a'). These cells could be SMNs that have down-regulated Alcam expression or, alternatively, they might be GFP-expressing interneurons . 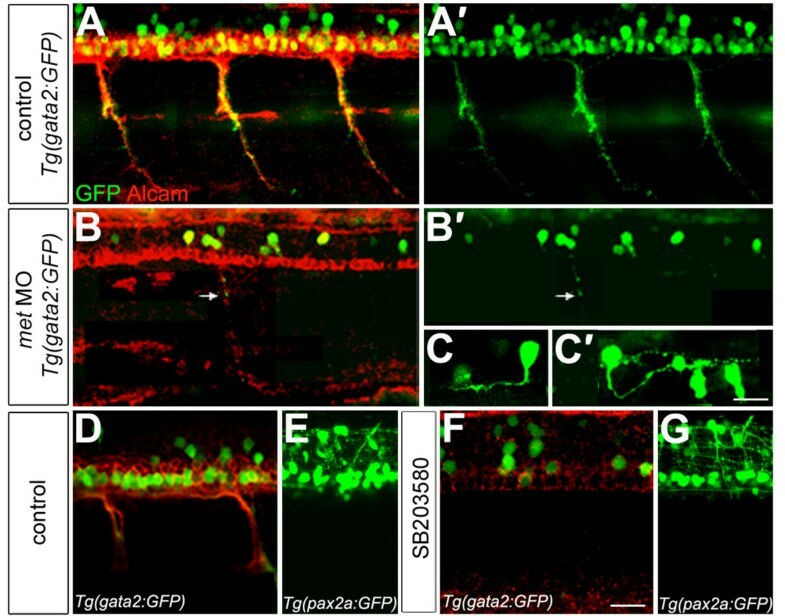 In contrast to control Tg(gata2:GFP) embryos, in met MO-injected Tg(gata2:GFP) embryos the number of ventrally projecting SMN somata and axons was severely reduced (Figure 6b,b'; Table 1) and some of the GFP-positive somata projected interneuron-like axons within the spinal cord rather than peripheral axons (Figure 6c,c'; Table 1). These cells might be interneurons that normally express GFP in this transgenic line. Alternatively, they could be SMNs that have developed as interneurons. Consistent with the latter possibility, the number of GFP-positive somata just dorsal of the SMN soma domain (more than three cell diameters dorsal of the floor plate) was increased in met MO-injected embryos (Table 1). It is clear that in met MO-injected embryos there are several types of GFP-positive interneurons, because some of them have ascending axons (Figure 6c) whereas others have descending axons (Figure 6c'). To learn whether Met knock down caused SMNs to die, we labeled embryos with acridine orange to reveal dying cells  at 28, 36, and 48 hpf, but saw no significant difference between the spinal cords of met MO-injected embryos and controls (data not shown). In addition, the overall cellular structure of the spinal cord appeared entirely normal in met MO-injected embryos (data not shown). Together these results suggest that Met is required for formation of at least some SMNs and raise the possibility that when Met is knocked down, at least some SMNs develop as interneurons. Met is required for secondary motoneuron formation. (a-b') gata2:GFP (green) transgenic embryos at 48 hpf labeled with antibody to Alcam (red). gata2:GFP is expressed in ventrally projecting SMNs, some of which also express Alcam (a); (a') shows only the GFP. met MO-injected embryos (b,b') show a severe decrease in SMNs, but Alcam labeling of the floor plate appears normal. A small number of SMNs form and make ventral projections (arrow). (b) Both markers shown; (b') only GFP shown. (c,c'). Some of the GFP-positive cells in met MO-injected embryos show interneuron-like axons. (c) An interneuron with an ascending axon; (c') an interneuron with a descending axon. The two GFP-positive cells to the right in (c') are SMNs. (d-g) gata2:GFP transgenic embryos (green) at 48 hpf labeled with Alcam antibody (red). Exposure to SB203580 (f) severely decreased the formation of SMNs relative to controls (d), but the overall architecture of the spinal cord appeared normal based on expression of GFP driven by the pax2a promoter (e,g). Scale bar, 20 μm in all panels except (c,c'), which is 10 μm. GFP-positive SMN axons (three segments/embryo) and somata (two segments/embryo) were analyzed in 48 hpf Tg(gata2:GFP) embryos. Soma counts of treatment groups are all significantly different from controls (p < 0.00015). Activation of the Met receptor can initiate signaling through several different intracellular cascades (Figure 1) [15, 57, 58]. To investigate which of these downstream pathways is involved in SMN differentiation, we treated embryos with compounds designed to inhibit specific intracellular signaling cascades activated by Met and other receptors, and assayed SMN development at 48 hpf. Specifically, we used U0126, which has been shown to inhibit MEK1/2 (Figure 1) , and SB203580, which has been shown to inhibit Akt and p38 (Figure 1) [34, 36]. The MEK1/2 inhibitor U0126 had no effect on SMN development (Table 2 and data not shown), indicating that the MEK1/2 pathway is not involved. In contrast, the Akt and p38 inhibitor SB203580 dramatically affected SMN development (Table 2). In fact, SMN development was even more severely affected by blocking p38 and Akt signaling than by knocking down Met function with MOs: inhibitor-treated embryos were missing essentially all SMN somata and axons (Figure 6d–g). There is some correctly spliced met mRNA following MO injection (Figure 1), suggesting that the more severe effect of the inhibitor could at least partially result from a more complete knock down of Met signaling than is achieved in met MO-injected embryos. This result also raises the possibility that in addition to Met, other pathways act upstream of p38 and/or Akt during SMN formation. Future experiments to learn the identities of these other pathways will help elucidate the mechanisms required for normal SMN development. In addition, zebrafish has two p38 genes, p38a and p38b, that are broadly expressed at the stages of development we have studied , raising the possibility that some effects on SMNs could be cell non-autonomous. Thus, to test whether SB203580 had a general effect on ventral spinal cord neurons, we treated Tg(pax2a:GFP) embryos  with SB203580 and examined their spinal cords. Spinal cord architecture appeared essentially normal in SB203580-treated Tg(pax2a:GFP) embryos (Figure 6d–g) suggesting that this inhibitor specifically affected SMNs. Together these results suggest that Met may act through the Akt and/or p38 cascades to promote formation of zebrafish SMNs. SMN somata were analyzed in three segments of each embryo at 48 hpf. In all cases, the three segments had the same phenotype; in other words, within an embryo all segments had reduced SMN somata or no segments had reduced SMN somata. Surprisingly, although SB203580-treated embryos lacked most SMNs, at 30 hpf their tail touch-evoked motility was essentially indistinguishable from control embryos (data not shown). Only a few SMNs have projected axons by this stage ; thus, this result suggests that at this stage most of the touch response is mediated by activity of PMNs, rather than by activity of SMNs, although this has not yet been tested directly. If this is the case, then the movement defects we observed at 30 hpf in met MO-injected embryos would have to arise from a requirement for Met in PMN differentiation, rather than from the decrease in SMN number. To test whether this was the case, we examined the effects of Met knock down on PMN development. Despite the motility defects in met MO-injected embryos, three quarters of the CaP axons looked essentially normal as judged by their morphology (Figure 5), suggesting that Met might be required for proper development of CaP characteristics other than the peripheral axon. To learn whether Met was required for differentiation of other features of CaP morphology, we examined CaPs in met MO-injected mn2Et embryos and we labeled embryos with zn1 and znp1 antibodies. Surprisingly, we found that many CaPs had an interneuron-like process within the spinal cord, in addition to the normal peripheral axon (Table 3; Figure 7a–a"). To learn whether there was a correlation between CaPs with truncated axons and those with interneuron-like axons, we analyzed morphology of a subset of CaPs (Table 4). There did not appear to be a correlation, as we found that both CaPs with normal-appearing peripheral axons and CaPs with truncated peripheral axons had interneuron-like axons. These results suggest that Met is important in maintaining CaP morphology by preventing CaP from forming an interneuron-like central process. Met is required for aspects of CaP identity. (a) A met MO-injected mn2Et (green) transgenic embryo labeled with znp1 antibody (red) showing that CaP has both a peripheral axon (arrow) and a central axon (asterisk). (a') The same cell showing only GFP. (a") The same cell showing only znp1 labeling. (b,c) Islet1/2 antibody (Isl; red) and zn1 plus znp1 antibodies (green) labeling showing that CaPs in met MO-injected embryos (c) co-express these markers as they do in controls (b). For each condition we examined eight spinal hemisegments per embryo. n = 56 met MO-injected embryos and 32 control embryos. (d) chat is expressed in somata in the normal location of PMNs; gray lines show segment boundaries. (e,f) Expression of chat (green) and the CaP and VaP-specific marker islet2 (red) shows that in met MO-injected embryos (f) CaPs express chat, as they do in controls (e). For each condition we examined eight hemisegments per embryo. n = 24 met MO-injected embryos and 15 control embryos. (g) Co-expression of chat (red) and met (green) in PMNs. Scale bars, 10 μm. CaPs were analyzed in 26 hpf mn2Et embryos; 3 hemisegments were examined per embryo. Axons were analyzed in mn2Et embryos at 26 hpf. 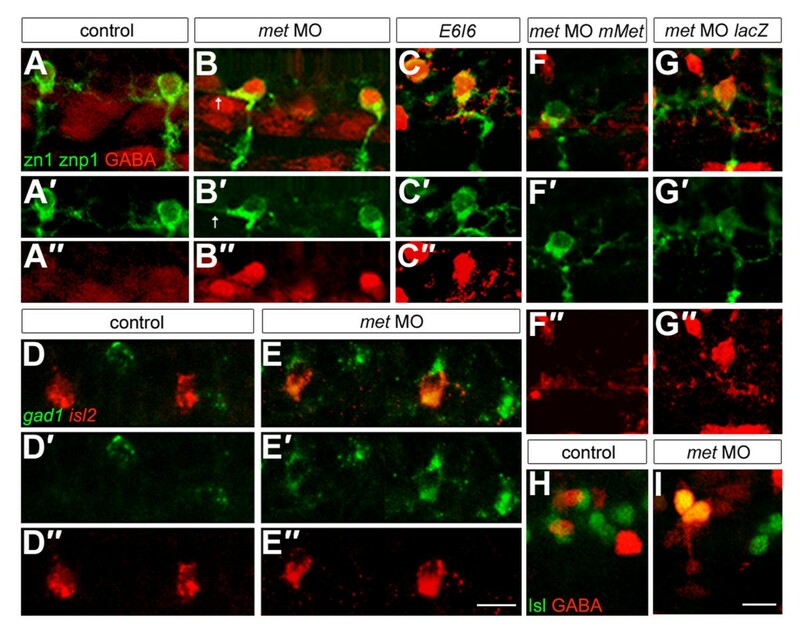 Based on their morphology, many CaPs in met MO-injected embryos appeared to have a hybrid identity that combined features of both motoneurons and interneurons. To learn whether this hybrid identity extended to molecular features, we assayed two aspects of CaP: expression of Islet proteins and neurotransmitter phenotype. We found that CaPs in met MO-injected embryos had normal expression of Islet proteins (Figure 7b,c), suggesting that they retained motoneuron identity. To learn whether CaPs expressed normal cholinergic properties or expressed interneuron-specific neurotransmitters, we tried several antibodies to ChAT, the ACh synthetic enzyme, but none of them worked in our hands. Because the chat sequence is highly conserved within vertebrates, we used the goldfish chat sequence  to blast zebrafish databases (NCBI) and found a hypothetical sequence with high homology to all vertebrate chat sequences. We amplified chat from zebrafish cDNA, verified the sequence and found that it was expressed in cells with the correct position and morphology to be PMNs (Figure 7d). We confirmed chat expression in CaPs using double fluorescent in situ hybridization with islet2 (Figure 7e), and also confirmed that CaPs co-express met and chat (Figure 7g). We analyzed chat expression in CaPs in met MO-injected embryos at 24 hpf and found that it was unaltered relative to controls (Figure 7e,f), showing that this aspect of CaP identity did not depend on Met function. We previously showed that in the absence of Islet1, zebrafish PMNs develop interneuron-like axons rather than their normal peripheral projections and that some of these cells express the interneuron-specific neurotransmitter GABA . Therefore, we asked whether CaPs expressed GABA when Met function is knocked down. We found that in embryos injected with either translation blocking or splice blocking met MOs, the majority of CaPs and VaPs expressed GABA (Figure 8a–c") in contrast to control embryos, in which no CaPs or VaPs expressed GABA (Table 5). We confirmed this by showing that in contrast to controls, in met MO-injected embryos CaPs and VaPs co-expressed GABA and Islet (Figure 8h,i). We assayed the time-course of GABA expression and found that it was first visible at about 24 hpf, shortly after the time at which met is expressed in PMNs. Because the GABA antibody cross-reacts with an antigen in the muscle (see Figure 8a,b), we confirmed PMN expression of GABA using a riboprobe to gad1, the synthetic enzyme for GABA [48, 82] (Figure 8d–e"). Expression of gad1 and GABA in PMNs of met MO-injected embryos is in stark contrast to control embryos, in which PMNs never express GABA (Figure 8a–e"; see also ). To confirm that expression of GABA in CaPs required Met function, we coinjected mMet mRNA with met translation blocking MOs (Figure 8f–f") and found that this abolished GABA expression in CaPs, whereas embryos coinjected with lacZ mRNA and met MOs expressed GABA in CaPs (Figure 8g–g"). These results show that not only do CaPs lacking Met function have a motoneuron/interneuron hybrid axonal morphology, they also express both motoneuron and interneuron neurotransmitters. Met is required to prevent CaPs from expressing an inappropriate neurotransmitter. For each condition we examined eight spinal hemisegments per embryo. (a-c") Embryos at 26 hpf labeled with antibodies to GABA (red) and zn1 plus znp1 (green); (a',b',c') only the green channel is shown; (a",b",c") only the red channel of the micrographs shown in (a,b,c) is shown. CaPs expressed GABA in embryos injected with translation blocking (b-b") or splice blocking (c-c") met MOs, but not in controls (a-a"). Note that some CaPs in met MO-injected embryos also have ectopic axons within the spinal cord (arrows). (d-e") Embryos at 26 hpf labeled with riboprobes to gad1 (green) and islet2 (red). (d',e') Only the green channel is shown; (d",e") only the red channel of the micrographs shown in (d,e) is shown. In met MO-injected embryos, islet2-positive CaPs also express gad1 (e-e"), whereas these two genes are not co-expressed in CaPs of control embryos (d-d"). (f-g") Embryos at 26 hpf labeled with antibodies to GABA (red) and zn1 plus znp1 (green). (f',g') Only the green channel is shown; (f",g") only the red channel of the micrographs shown in (f,g) is shown. CaPs do not express GABA in embryos co-injected with met MO and mMet mRNA (f-f"), but do express GABA in embryos co-injected with met MO and lacZ mRNA (g-g"). (h,i) Embryos at 26 hpf labeled with antibodies to GABA (red) and Islet (green). CaPs co-express Islet and GABA in met MO-injected embryos (i) but not in controls (h). n = 80 embryos in (a); n = 128 embryos in (b); n = 24–32 embryos each for (c,e,f,g); n = 20 embryos for (h); n = 35 embryos for (i). The phenotype was seen in 70% of embryos injected with the splice-inhibitor MO and 80% of embryos injected with translation-blockers; in affected embryos all segments showed the phenotype. Rescue was seen in 90% of embryos injected with mMet mRNA and 0% of embryos injected with lacZ mRNA. Scale bars, 10 μm. CaPs were analyzed in four segments of each embryo. In all cases, CaPs in all four segments had the same GABA phenotype; they were either all GABA+ or all GABA-. We used pharmacological inhibitors to learn which Met-activated intracellular signaling pathway(s) transduced the signal required to prevent GABA expression in CaP. Embryos were exposed to inhibitors of these pathways from 16–26 hpf, then fixed and examined for expression of GABA in CaPs (Table 5). Exposure to the MEK1/2 signaling inhibitor U0126 resulted in GABA-positive CaPs, similar to results observed in met MO-injected embryos (Figure 9a–c"). In addition, some CaPs in U0126-treated embryos had both peripheral and central axons, similar to met MO-injected embryos (Table 3; Figure 9e–g). Together these results suggest that the CaP axonal and neurotransmitter phenotypes seen in the absence of Met function are likely to result from lack of Met activation of MEK1/2. We also treated embryos with SB203580, which inhibits the Akt and p38 pathways and blocked SMN development. In contrast to the effect of U0126, CaPs in embryos exposed to SB203580 had the same neurotransmitter (Figure 9d–d"; Table 5) and axonal (Figure 9h; Table 3) phenotype as control CaPs, suggesting that signaling via p38 and Akt is not involved in regulating CaP neurotransmitter and axon phenotype. Met signaling may influence CaP axonal and neurotransmitter phenotypes through the MEK1/2 pathway. All panels show mn2Et transgenic embryos. (a-d") Embryos at 26 hpf showing GFP (green) and GABA (red); asterisks indicate CaPs or CaP/VaP pairs. (a',b',c',d') Only the green channel is shown; (a",b",c",d") only the red channel of the micrographs shown in (a,b,c,d) is shown. CaPs express GABA in U0126-treated embryos (c-c") and met MO-injected embryos (b-b") but not in controls (a-a") or in SB203580-treated embryos (d-d"). (e-h) Some CaPs have both peripheral (arrows) and central (asterisks) axons in U0126-treated embryos (g) and met MO-injected embryos (f); CaPs have only have peripheral axons in controls (e) and in SB203580-treated embryos (h). Scale bars, 10 μm. We report two key findings about the role of the Met receptor tyrosine kinase in motoneuron development. First, Met is required for formation of some zebrafish SMNs. Our experiments suggest that this role of Met acts through the p38 and/or Akt signaling cascade. Second, Met is required to prevent CaP motoneurons from co-expressing features of motoneurons and interneurons, including axon pathway and neurotransmitter phenotype. 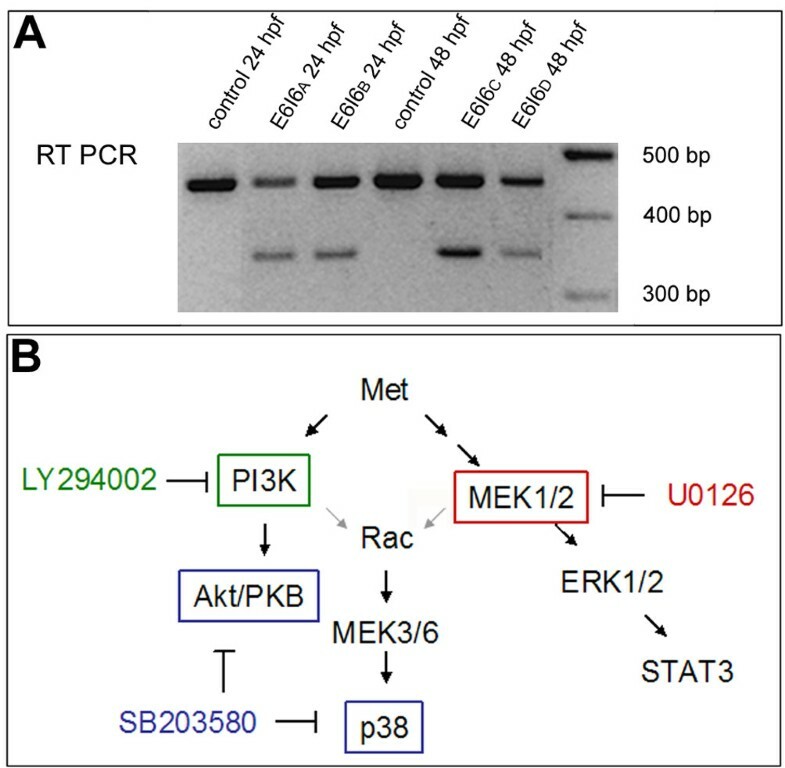 Our experiments suggest that this role of Met acts through the MEK1/2 signaling cascade. We discuss each of these observations in turn. In chick, mouse, and rat, Met is expressed in a subset of spinal motoneurons and the Met ligand HGF is important for the differentiation of these cells [14, 16, 17, 19]. Met appears to be expressed primarily in limb-innervating lateral motor column motoneurons and HGF acts as a chemoattractant for the axons of these cells in vitro and in vivo, as well as promoting their survival through the period of normal programmed cell death when tested in vitro [16, 17, 19]. In zebrafish, met is also expressed in a subset of spinal motoneurons, in this case in all primary and at least some secondary motoneurons of the medial motor column. In the case of SMNs, Met appears to be required for formation of these cells, as their number is significantly reduced when Met activity is knocked down; whether or not this is the case for the HGF-dependent limb-innervating motoneurons of chick, mouse, or rat has not been reported. The decrease in SMN number when Met is knocked down might result from death of SMNs or their progenitors. We did not see increased cell death, suggesting an alternative possibility that SMNs differentiated as interneurons, as we have previously seen in the absence of Islet1  or Nkx6 proteins [65, 83]. 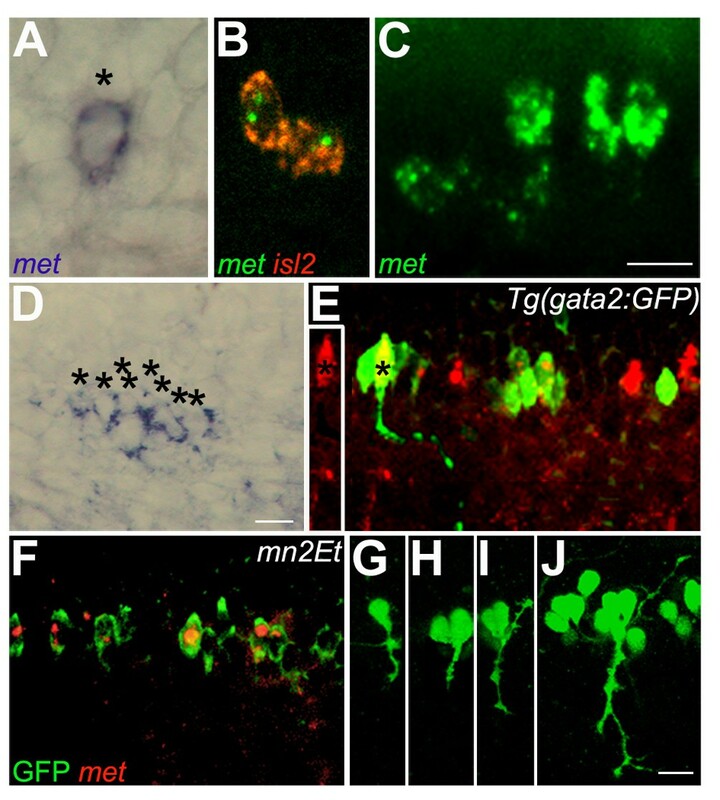 Consistent with this possibility, at 48 hpf there were more interneuron-like axons within the spinal cord and somata in positions consistent with spinal interneurons in Tg(gata2:GFP) embryos injected with met MOs than in Tg(gata2:GFP) control embryos. To begin to learn which intracellular signaling pathways may be involved in Met-mediated SMN formation, we exposed embryos to inhibitors that act on specific pathways downstream of Met activation. Our results suggest that the p38 and/or Akt pathways are required for normal development of SMNs. However, a caveat to this interpretation is that the phenotype was much more severe when these pathways were blocked than when Met was knocked down using MOs. One possible explanation is that Met was incompletely knocked down by our MOs but completely blocked by the pharmacological inhibitor. Alternatively, because these pathways are activated by other receptors in addition to Met, pharmacological blockade may lead to more widespread effects, including effects that are non cell-autonomous (see below). In the future it will be important to learn which other receptors activate these pathways in SMNs and how this is related to activation of these pathways by Met. Finally, the expression of both zebrafish p38 genes is widespread throughout early development , raising the possibility that p38 activated pathways could have both cell-autonomous and non cell-autonomous effects on SMN development. We have previously found that knocking down function of several transcription factors expressed in PMNs, and in some cases in their progenitors, results in these cells expressing interneuron-like properties. Thus, in the absence of Islet1, PMNs develop interneuron-like axons within the spinal cord, rather than peripheral axons, and many of these cells express the interneuron neurotransmitter GABA . Similarly, in the absence of Nkx6 transcription factors, MiPs develop a hybrid phenotype in which they have both peripheral axons that innervate muscle and central axons that extend within the spinal cord, although these cells do not express GABA . Here we report that knocking down Met function causes CaPs to express a hybrid phenotype in which many of them have both a peripheral axon innervating muscle and a central axon extending within the spinal cord. In addition, these cells co-express cholinergic and GABAergic properties. Despite expression of GABA, PMNs are still able to activate muscle in the absence of Met function. However, the touch response is significantly slower than in control embryos at developmental stages at which this behavior is likely to be mediated primarily by PMNs. Thus, this slower response is probably a result of impairment in PMN function. The ability of PMNs to develop a hybrid phenotype in the absence of Met reveals a degree of plasticity not previously reported for motoneurons. Previous studies showed that the absence of specific transcription factors in motoneuron progenitors [9, 84–89] or in newly post-mitotic motoneurons  allows these cells to co-express motoneuron and interneuron properties. These studies reveal the importance of specific transcription factors in preventing motoneurons from developing interneuron properties early in their development. Other studies have shown that postmitotic motoneurons can change their identity from one motoneuron subtype to another in response to environmental cues  and that environmental signals can override genetic programs and cause motor axons to extend along aberrant pathways . These studies reveal plasticity in motoneuron subtype specification. In contrast, here we show that motoneurons are able to express interneuron-like properties at late stages of development. Zebrafish met is expressed in PMNs about 6–8 hours after they initially extend growth cones and after their axons have extended to and innervated their specific target muscles. Thus, our studies raise the question of whether the ability to develop interneuron characteristics long after their peripheral axons innervate their muscle targets is a general feature of motoneurons. It is well-known that at least some neural crest-derived peripheral neurons have long-lived phenotypic plasticity [10, 11], but it is not typically believed that this is the case for central neurons. This issue is particularly important because a recent study has shown that forcing motoneurons to release neurotransmitters other than ACh causes their muscle targets to express receptors to the motoneuron-expressed neurotransmitters , potentially leading to inappropriate muscle responses to motoneuron activation. The late expression of met in PMNs raises the interesting question of what prevents CaPs from extending interneuron-like axons and expressing GABA at stages prior to met expression. Although we do not have an answer to this question, we hypothesize that many different factors are required to prevent motoneurons from expressing interneuron-like properties. Consistent with this hypothesis, several transcription factors, including Islet1 , Nkx6 [85, 88, 65, 83], Lhx3 , Hb9  and AML1/Runx1  have been shown to prevent various types of motoneurons from adopting interneuron-like properties. It is not yet clear, but will be exciting to learn, the identities of the downstream targets of these transcription factors and how they regulate different aspects of interneuron development. We predict that different downstream targets prevent motoneurons from expressing different interneuron properties at different developmental stages. We have proposed that zebrafish PMNs have a high propensity to develop into motoneuron/interneuron hybrids because, as has been postulated from studies in mammals , zebrafish motoneurons are closely-related to specific types of interneurons . In zebrafish and chick, both motoneurons and interneurons can arise from a single progenitor [92–94]; whether this is also the case in mammals is unknown because single progenitor labeling experiments have not been reported. Although vertebrate motoneurons are generally considered exclusively cholinergic, several recent studies provide evidence that mammalian spinal motoneurons can release both ACh and glutamate at central synapses on Renshaw cells [4–6]. However, ACh is still thought to be the only neurotransmitter that mediates motoneuron activation of skeletal muscle [4–6]. Thus, it is surprising that during early development, frog muscles express not only AChRs at the nascent neuromuscular junction (NMJ) but also several other types of neurotransmitter receptors, including glutamate receptors, glycine receptors and GABA receptors . From experiments in which they altered motoneuronal neurotransmitter expression, Borodinsky and Spitzer  have argued that the final complement of receptors at the NMJ results from matching the neurotransmitter released by motoneurons with the receptors on muscle cells. In their studies, they never saw GABA expression by motoneurons under control conditions. However, several earlier studies reported transient expression of GABA in motoneurons in chick, monkey  and rat . GABA may act not only as a neurotransmitter, but also as a trophic factor during development [97, 98], and it may be important for integrating developing neurons into circuits . These features might explain early transient expression in neurons that do not normally use GABA as a neurotransmitter. However, neither we nor others have reported GABA expression in zebrafish spinal motoneurons, and the issue of whether transient GABA expression is a common feature of vertebrate spinal motoneurons remains unresolved. It has been known for many years that environmental signals can alter subtype specification in newly post-mitotic motoneurons . Here we show that motoneurons retain the ability to develop interneuron-like characteristics, including both axon trajectory and neurotransmitter phenotype, long after they have innervated their muscle targets. In zebrafish, motoneurons and some types of interneurons are generated from the same progenitor domain [92–94], and previous studies showed that in the absence of Notch signaling motoneurons are the preferred fate of cells within that domain [94, 100]. Here we suggest that despite this, motoneurons may require continuous signaling to prevent them from developing interneuron-like properties. Our current results also show that motoneurons that co-express interneuron-like properties can still innervate target muscle. 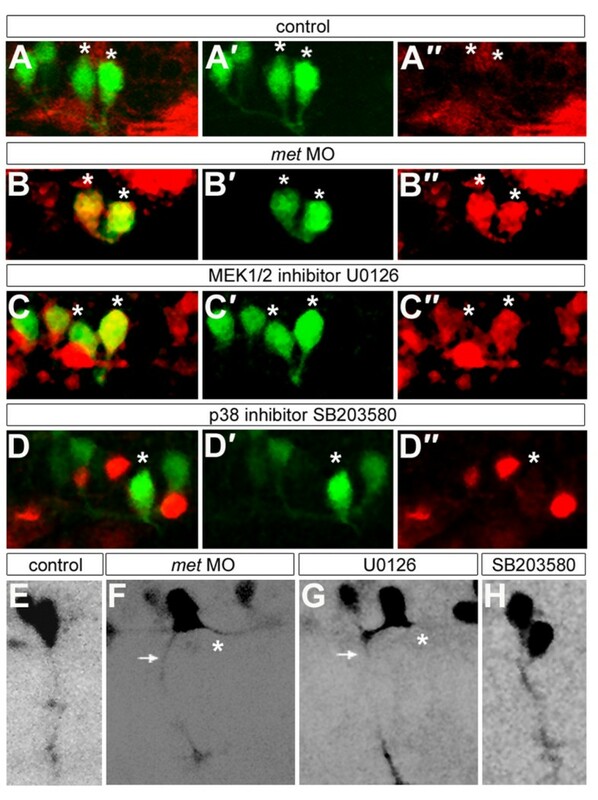 In addition, we suggest that the Met receptor tyrosine kinase acts through different intracellular signaling cascades to affect distinct aspects of development in different motoneuron subtypes. We thank Keith Beadle for help with motility assays, G Vande Woude for the mouse Met mRNA, Peter Currie for a met MO sample and a partial met DNA, Shin-Ichi Higashijima and Joe Fetcho for gad1 mRNA, Steve Ekker for the mn2Et line, Michael Brand for the Tg(pax2a:GFP) line, Shuo Lin for the Tg(gata2:GFP) line, Chris Doe, Phil Washbourne and Monte Westefield for critical reading of the manuscript, and Amanda Lewis, Joy Murphy, Jacob Lewis and the staff of the UO Zebrafish Facility for animal husbandry. Supported by NIH grants NS23915 and HD22486 and AHA postdoctoral fellowship 0420027Z. AT carried out all of the experiments described in this paper and helped draft the manuscript. JSE participated in the conception and design of the study and helped draft the manuscript. All authors read and approved the final manuscript.